Focal-Plane Shutter in addition to the central locking is one of two common design principles for the closure, placed in front of the image sensor module. 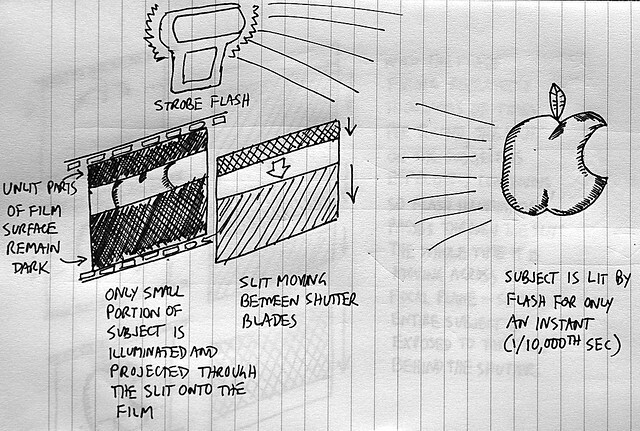 For this reason, in the basic article on Flash Modes; Rear curtain flash mode was explained. For a new person in DSLR Photography, at least Shutter Button and Shutter Mechanism is important to read in the context of learning about Focal-Plane Shutter. Please note that, Focal-Plane Shutter is not present in all DSLR camera models but only in some models from certain manufacturers. Its quite complex matter whether it is present in Canon DSLRs at all. The focal plane shutter is made up by two shutters, it forms the shutter curtains (which we said we wrote in other linked article above). The curtains move depending on the design either both horizontally or both vertically. After the release of the first curtain, second one opens and plays for free exposure. If the required exposure time is reached, the second curtain covers the opening again by following the first curtain movement. For short exposure time, the second curtain follows the first curtain so fast, that at no time the entire exposure is released. Rather, a slot is formed of two curtains which is moved over the sensor. Different portions of the image are exposed at different times. Different materials are used for manufacturing of the Focal-Plane Shutter; such as rubberized fabric, titanium foil (clothed). In some closures, the respective curtain is formed by overlapping metal plates, wherein the movement can be linear in contiguous fins or furling in modern constructions. Focal-plane shutter is better suited to realize very short exposure times. DSLR camera achieves shutter speeds of 1/8000 seconds and less. With moving objects, in fact the entire image area is exposed at once, but the slit moves across the image by the rolling shutter effect contributing to geometric distortions. The magnitude of this bias will depend on the angular velocity, the direction of movement of the slot relative to the direction of the exposure time and the width of the slit from. The effect can be both distracting and, in rare cases, be used artistically. This Article Has Been Shared 8267 Times! Cite this article as: Abhishek Ghosh, "Focal-Plane Shutter," in The Customize Windows, May 3, 2013, April 20, 2019, https://thecustomizewindows.com/2013/05/focal-plane-shutter/.